I arrived with my associate, Vincent Hickman, in this lovely little town in the southern Netherlands to attend the opening of the amazing TEFAF fair. 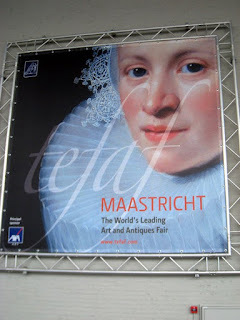 It has to be the greatest and most important fair for art from ancient times to the modern era anywhere. There were 10,500 visitors who came for opening day and 80 private planes arrived at the small Maastricht airport for the event, more would follow later during the run of the show. There were probably 2,000 more attendees than came a year ago demonstrating that people are feeling more secure financially and socially. I have been here almost every March for the last 15 plus years and yet, it never ceases to amaze me. It is not a static fair. It ebbs and flows with different markets dictated by the tastes of collectors and the fashion of the times. Though some years ago the drawings dealers bowed out en masse because of lack of sales, they have now all come back in a whole new section of dealers for works on paper, including drawings, prints, photographs and books. In total the fair has over 260 exhibitors this year. Some worry that the fair is getting too large, but I believe that as long as they maintain a certain level of quality both for exhibitors and the art they show TEFAF will continue to thrive. The show is vetted by experts who are dealers, curators and scholars and their vigilance helps to keep that level of quality high. 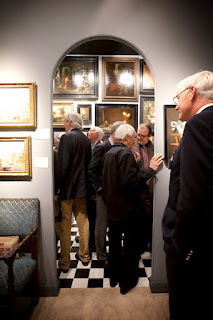 What makes it manageable for the visitor is that the fair is divided into sections so you can just go to see old masters or modern or decorative arts or classical art or works on paper. You must pace yourself and don’t try to see it all at once any more than you would want to see the entire Louvre in one day. If you are into multicultural phenomenon this is the place to be. Maastricht is on the borders of Germany and Belgium and a short distance from France you can easily make side trips to art centers such as Aachen, Cologne and Brussels. Exhibitors come from 17 countries. I noted that as I walked across one aisle, approximately 5 yards I heard people speaking French, English, German, Italian and Dutch. A little further on I heard a bunch of languages that I did not understand including Chinese. How can they sell all this art? Well, of course, they cannot but when you have this much choice of top quality goods and so many collectors who came to this town only to attend this fair a great deal does go. One British dealer told me he does between 25% and 35% of his annual business here! That is not necessarily all done in his booth but he makes connections, accepts reserves and over the following months finalizes sales which would not have happened without TEFAF. 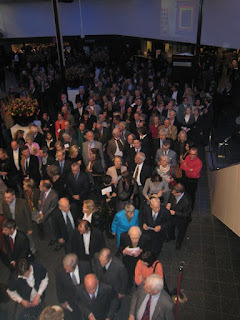 Museum directors and curators come in staggering numbers often with trustees in tow and they buy as well. During the few days I was here I noticed coming from the States staff from, The Museum of Fine Arts, Boston, The Detroit Art Institute, The Metropolitan Museum, The Art Institute of Chicago, The Minneapolis Museum of Art and The Wadsworth Athenaeum to name some. For those who are looking for a field of interest in which to collect, for the seasoned collector who wants to see what might still be available, or simply for the art interested this is a must. More than once this weekend I heard the lines, “I have never been here before but I heard how incredible this fair is and I still can’t believe it. Come, pace yourself, enjoy the lovely country side the possibility of short side trips but each day hit the fair and see something new. After 3 days of only visiting the fair we are breathless in every sense. Will I see you in Maastricht ?